Gov. 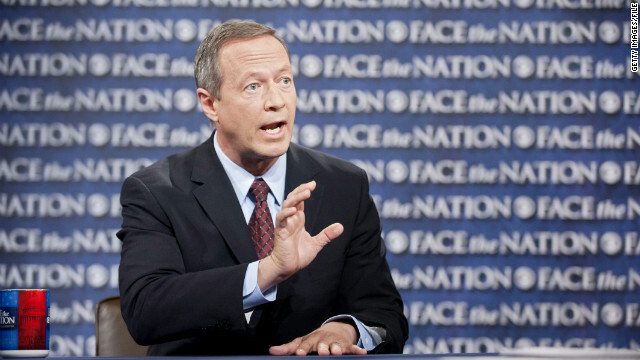 Martin O'Malley is expected to sign the bill into law. Maryland is set to adopt some of the nation's strictest gun laws after the state Senate passed a bill on Thursday that includes an assault weapons ban and gun magazine limits. The legislation now goes to Democratic Gov. Martin O'Malley, who is expected to sign it into law. "With today's vote, Maryland has chosen to enact a comprehensive, common sense approach to prevent gun violence & make our communities safer," he posted online after the vote. It includes a ban on assault-style weapons and sets a 10-round limit for gun magazines, two measures topping the list of many gun control advocates. Democratic Gov. Dannel Malloy signed a similar restriction into law in Connecticut earlier on Thursday. Colorado and New York have also tightened their gun laws since the December shooting at Sandy Hook Elementary School in Newtown, Connecticut. Maryland will join Connecticut and New York, as well as Hawaii, Massachusetts and New Jersey in requiring gun owners to be fingerprinted and licensed by the state under the new law. The new law also will require training for many first-time gun owners and bans some individuals with mental health issues from gun ownership. The top Republican in the Maryland state Senate told CNN affiliate WBAL in Baltimore that the actions he thought most likely to reduce gun violence were not in the law. "The areas we could have helped with – the mental health area or making sure criminals, when they use guns, have tougher sentences or issues related to security officers in schools that would have actually added safety to the process – (are) not in the bill," state Senate Minority Leader E.J. Pipkin said. But Vinnie DeMarco, president of Marylanders to Prevent Gun Violence, told the station the requirement that gun owners be fingerprinted was an important requirement. "Fingerprint licensing is the best way to states can prevent gun violence," he said. Legislation proposing universal background checks on gun sales and other proposals to stem gun violence is working its way through the U.S. Senate. The measure does not include a ban on assault weapons or magazine capacity restrictions. Finally some sanity has emerged out of all these tragic gun killings. Take that Wayne Lapierre and your NRA bozos. What happens if another mass shooting takes place in one of these states that passes laws like this? Is it going to be the fault of states that didnt pass laws? Why don't they prohibit guns at schools? ...our const tutional rights are being violated...since when a state can overide the const tution and will of the american peoples' right to bear arms...civil disobedience is only a stone's throw away...mentally ill can join the military but they can't own a gun...i see some ada issues, just as obstructive, and what's with the fingerprinting? purchasing a gun isn't a crimminal violation or crimminal activity...whose file supposed to hold these prints??? these are violation of freedoms! You got it right. I can't see this lasting long before it gets the clamps put on it at the federal level. Freedom is great on the things you agree with, right? Oh no. Now everyone in Maryland will be defenseless against criminals. Who will somehow magically still be able to get guns. Exactly ! Most crimes committed with guns, are committed by criminals that buy guns on the street illegally. Not from federally licensed dealers ! These politicians are going at this the wrong way ! So, where does the line start for all of the criminals to hand in their 15 and 17 round mags? I like to go there and record the sound of crickets. They help me sleep at night. The new gun laws however, will not. Finally! Now this is a new gun law that i can stand behind! Assault rifles should have NEVER been allowed to be purchased by common citizens! @chrissy – All common citizens carry AK47 in Pakistan. Aren't you so proud? But then we will have a dictatorship!!! And the excuse's keep marching on! Do we really want to try and fix or solve this problem or just live with the status quo? YES, I totally agree that gun control, by itself, is not the answer. However, the attempts to terrorize folks with the "loss of our 2nd amendment" rights is stupid! OUR 2nd amendment has been perverted, misused, interpreted, and used as an excuse, for the sole purpose of those advocating it. The excuse that an AR 15, and related assault rifles are made for hunting? The AR 15 was the rifle that I carried in Viet Nam and along with many other assault type rifles their original design was to kill your enemy, NOT for hunting! I find it hard to beleive that a true hunter feels it is sporting to use any weapon that can put multiple rounds downrange if you miss with your first shot? “The AR 15 was the rifle that I carried in Viet Nam”. That’s interesting that you were issued an AR 15 when everyone else was issued an M-16. Fact – (AR15) is semi-auto only; the other (M-16) is a selective fire version capable of full auto fire. The civilian AR 15 is not an assault rifle; The military M-16 is an assault rifle. @ km, why would i be proud that your country is full of barbarians? If you are maybe you should move back there instead of stalking me! they wont let me post my last comment cuz it was true. Once again, they don't let me post the reality of the situation.